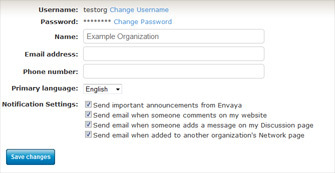 The Envaya account settings page allows you to can update your organization's contact information and other settings. When you are logged into Envaya, the icon at the top of the page will take you to the account settings page. On this page you can change how your organization's name appears on Envaya, and update your email address and phone number. In the Primary language section, you can set the language that you primarily use for the written content on your website. In the Notification Settings ﻿section, you can change when Envaya will contact your organization. To save your new settings, click the button at the bottom of the page when you are finished. From your account settings page, you can change your organization's username by clicking Change Username. Note that when you change your username, your website address on Envaya will also change (from http://envaya.org/old_username to http://envaya.org/new_username, for example). If somebody visits your old website address, Envaya will automatically redirect them to your new website address. After you change your username, another organization may register your old username and create a website with your old website address. From your account settings page, you can change your organization's password by clicking Change Password. 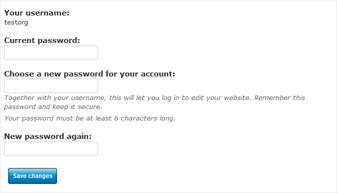 To change your password, you will need to enter your current password and then your new password twice. Your password must be at least 6 characters long.